Ladies and Gentlemen, Introducing The Roommates! You are here: Home / Slush Pile / Ladies and Gentlemen, Introducing The Roommates! The following is a fictitious account. Any resemblance to real people or actual events is simply a figment of your paranoid imagination. Quite simply, none of this ever happened. It is not real. For that matter, how do you even know you are real? I should know. I was voted most likely to be a cartoon character, a position I still aspire to. An artifact of the recently unearthed slushpile of Zig Jones, this piece comes from the early 1980’s, when leisure suits breathed their last, big hair was big and a long-forgotten band topped the pop-music charts. 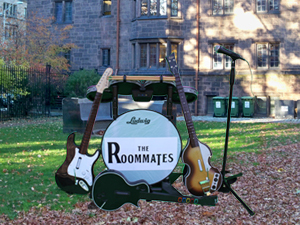 For a brief time, every pair of ears rang with the tunes of The Roommates, every pair of lips sang the melodies of The Roommates and every pair of eyes watched, read and absorbed all that was The Roommates. Discovered by Jones, The Roommates shot to instant glory when they first appeared on the famous rock host’s weekly show. But The Roommates, inscrutable from the very beginning, left the scene just as quickly – and mysteriously – as they arrived. Indeed, the band is so thoroughly forgotten, there’s not a shred of evidence of their actual existence. Wikipedia contains no reference to their greatness. Popular search engines turn up nothing. Even the Library of Congress has no work copyrighted by The Roommates (which, given their infamous anti-establishment fervor, is only to be expected). For two-and-a-half short years between the eighth and ninth decades of the twentieth century, society and culture witnessed and experienced what has been a cyclical event: the all-encompassing power of a flash of change in popular music. Each successive generation seems to have fallen under the awe-inspiring power of a musical deity, from Sinatra to Elvis to The Beatles to, most recently, The Roommates. (It is interesting to note the cycle skipped a beat in the seventies, perhaps a tribute to the formidable influence of The Beatles, and quite possibly at once both providing and explaining the reason for The Roommates’ sudden and dramatic rise.) It’s been over three years since they last released a record, but the overwhelming totality of The Roommates’ grasp and modification of our culture is all the more apparent now than at the time of their final recording “Why is Why?” in 1981. It began as more or less a joke in 1979. After appearing at numerous bars and clubs, the four boys had developed quite a following (in the guise of the local police and various vigilante groups). Fortunately for music fans across the globe, damage and petty theft notwithstanding, no charges were ever brought forward. During an interview in the summer of 1982, Rich told Barbara Walters the group fully expected leniency. At the time he still refused to acknowledge the scandal their activities caused in the Bible Belt once The Roommates became a national phenomenon. “In fact,” he tells Walters, “after Scot got out of that little illegal firearms problem with nary a scare, it became evident the authorities really weren’t.” This quote is significant for two reasons. The event Rich refers to actually occurred before he joined what was to be coined as the next generation of The Beatles. Obviously he couldn’t have known what the others were feeling at the time. Yet this disregard for chronology, as well as the phrase “the authorities really weren’t,” provides a clue to The Roommates’ general abhorrence of authority. It also permits us to immediately recognize the established character of Rich – that of the anarchist. Many critics have argued over the viability of claiming that Rich was actually an anarchist, especially given his success in the corporate world after the group split. With the benefit of hindsight, the critics point to one of the band’s last hits, the surrealistic song “Revelation: Number – Nein!” From the title and the lyrics, it appears, at least superficially, The Roommates, and particularly the authors of this cut (Rich and Scot), held mathematics, and, more generally, structure, in low esteem. Released in 1981 at the height of their experimentation with hallucinogenic breakfast cereals, the entire number (pun intended ironically) consists of the boys speaking the word “number” with Rich immediately responding with an impacting “Nein!” All this is spoken while a musical montage – everything from Gregorian Chants to Beethoven to Cole Porter – competes for predominance in the background. There has been much speculation on whether The Roommates had employed reverse tapes at this point in their career. (It was obvious by late 1981 that this was the case, given the title hit of the Bombs Away! album where, when played backwards, one can unmistakably make out the voice of Rich incessantly pleading, “Pluck me, Ted. Pluck me, Ted…” or at least something that sounds pretty close to that.) Modern critics claim “Revelation: Number – Nein!” was actually the first tune where The Roommates used backward tapes. Indeed, when played backwards, the group seems to be repeatedly saying, “Turn me on, Friedmann!” If true, it could explain the folly of the “Rich as anarchist” claim. Alexander Friedmann was an early twentieth century mathematician who is now known as one of the fathers of the Big Bang Theory of cosmology. Clearly, argue the revisionists, the song was a plea for more, not less, leading-edge mathematics. Nonetheless, the practical effect of this popular hit was the avoidance of the mathematics major by the bulk of college students. Professor Henrick DeSitter, then Chair of the Department of Mathematics at Berkeley, in his book Where Have You Gone, Carl Friedrich Gauss?, points to “Revelation: Number – Nein!” as perhaps the key cause for the near closing of Berkeley’s Math Department and the current shortage of mathematicians. When asked about the true meaning of the song in the Walters interview, Rich, currently a leading edge software engineer for his own Fortune 500 firm, shrugged his shoulders and said, “I’m not that interested in popular art and literature. Why don’t you ask me something about Victorian novels?” Victorian novels! In retrospect, the anarchy theory looks pretty suspect. At the very beginning, however, things were quite different. Their first hit “It’s My Miller Sign” proves this. The song, written by Ted and Frank, smacks of existential greed and hedonism. In it, the two songwriters sang opposing parts, each claiming ownership of an empty case of beer bottles. The character development jumps from the lyrics, as one is immediately struck with sympathy for both antagonists. What the lyrics do not bring up, though, is the fact that neither character really owned the empties and neither wanted to return them. Rather, we have Rich singing the unspoken conscience of both characters with a line so popular it has become cliché: “I want to break them, bust them over heads!” Anarchy evidently reigned in the early days. Sociologists now agree it was this appearance of anarchy and the accompanying sado-masochism that attracted the initial fringe crowds to The Roommates. Even before “It’s My Miller Sign,” the anarchy theme pervaded their work and concerts. Scot, Ted and Frank had been together since 1978 playing the freshman crowds. Not much survives from that era, but we are fairly confident their anti-establishment demeanor started at nearly the onset of their career, as revealed in the 1979 interview on Zig Jones’ Rock Waves program. Only two days after they had met, Ted broke Frank’s finger. In pain and shock, a disoriented Frank could only shout, “My Bach Orchestra audition is tomorrow!” A police officer called by Ted offered, in jest, to step on the mangled digit, jarring the two budding musicians, who had not realized the offer was only a joke. “Those dirty pigs,” recalled Frank spitefully to Zig Jones. “How could a person of such responsibility be so cavalier?” cried Ted when reminiscing years later. The seeds of rebellion were set. This was originally an unscripted skit we did on my WYBC radio show in 1979. This particular draft was written sometime late in 1984 or early 1985. I don’t know when it was originally written, but my guess, based on where I found an earlier draft, was the week before graduation in May 1982.